Dave and I attended an evening hosted by Tanqueray Gin at the Lindt Chocolate Studio in Cape Town. I love Lindt chocolate as they make the most amazing sugar free varieties. Sadly I have only been able to get these in Europe and when we have been in Switzerland I have stopped in at the Sprüngli shop to get truffles. Lindt has been at the forefront of chocolate making since 1845, developing the conch which is what polishes chocolate. Polished chocolate gives the melting mouth feel and that is what counts the most when decided on a good quality product. Chocolate making is a very complex procedure and you can read more about it here. The chocolate sourced by Lindt comes from forests 15 to 20 degrees each side of the equator. The pods grow all over the tree and branches and the fruit is harvested by hand. Mallets are used to crack open the pods and the beans are then removed. These are covered with mucilage which needs to be scraped off. Once the beans are clean they are placed onto a wooden crate for fermentation and then onto wooden crates for drying. This is important as the beans are stockpiled for a year to 18 months and the drying prevents mould from forming. Once dry, the beans are placed into hessian bags and sent to the factory for quality testing. They are cleaned and washed and steamed before the husks are removed. The cacao nib is what is used to make chocolate and this provides the flavour and the fat. The fat, which is cacao butter, is highly prized on the trading market. The chocolate then gets cleaned again and the thick liquid gels are refined through rollers until they are 18 to 20 microns. This is because the palate picks up anything more than 30 microns. This refined chocolate is mixed with sugar, milk powder (from Swiss cows) and soy lecithin. Soy lecithin is added to give the melting sensation. Once all the ingredients have been mixed, the chocolate is tempered, moulded, set and wrapped. Now, all you have to do is unwrap the chocolate and place some in your mouth. Allow the heat from your mouth to melt the chocolate and you will get the whole taste sensation. The best thing about chocolate is that you can bake with it, and in so many ways. The mixture for a chocolate fondant is what is referred to as an unstable mixture. Because of this, it can be left in the fridge for 5 days. Thanks Uru, that was the intention! Sounds like a tasty decorating recipe! Fabulous recipe Tandy – you have a perfect looking fondant. How fabulous is the Lindt Chocolate Studio? I LOVE that place. I went to an event a month or so back and was seriously impressed. 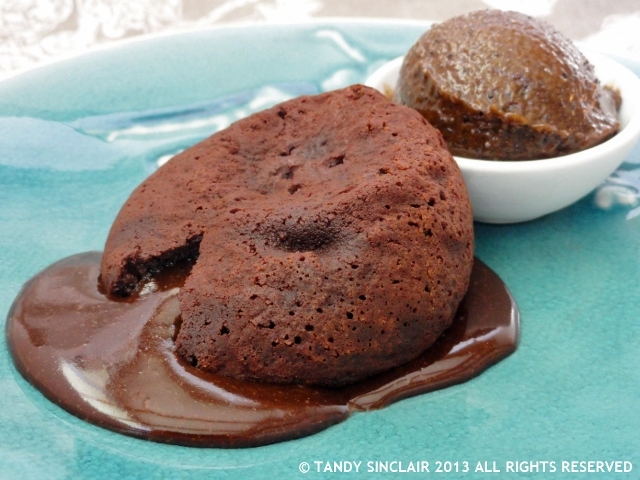 Thanks so much for entering this wonderful fondant recipe into Classic French. That gooey centre is just gorgeous. Ooo, I like the addition of the rose and lavender petals!